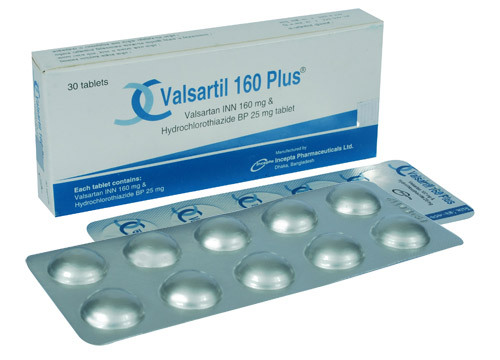 Valsartil 80 Plus: Each tablet contains Valsartan INN 80 mg & Hydrochlorothiazide BP 12.5 mg.
Valsartil 160 Plus : Each tablet contains Valsartan INN 160 mg & Hydrochlorothiazide BP 25 mg.
Valsartan is an oral medication that belongs to a class of drugs called angiotensin receptor blockers (ARBs). It is orally active and specific angiotensin II antagonist acting on the AT1 subtype. Angiotensin\\\'s attachment to the receptors cause the blood vessels to narrow (vasoconstrict) which leads to an increase in blood pressure (hypertension). Valsartan blocks the angiotensin II receptor. By blocking the action of angiotensin, Valsartan dilates blood vessels and reduces blood pressure without affecting pulse rate. Valsartan has much greater affinity (about 20,000-fold) for the AT1 receptor than for the AT2 receptor. It does not bind or block other hormone receptors or ion channels known to be important in cardiovascular regulation. Hydrochlorothiazide is a thiazide diuretic. Thiazides affect the renal tubular mechanisms of electrolyte reabsorption, directly increasing excretion of sodium and chloride in approximately equivalent amounts. Indirectly, the diuretics action of Hydrochlorothiazide reduces plasma volume, with consequent increase in plasma renin activity, increase in aldosterone secretion, increase in urinary potassium loss and decrease in serum potassium. The renin-aldosterone link is mediated by angiotensin II, so co-administration of an angiotensin to receptor antagonist tends to reverse the potassium loss associated with these diuretics. 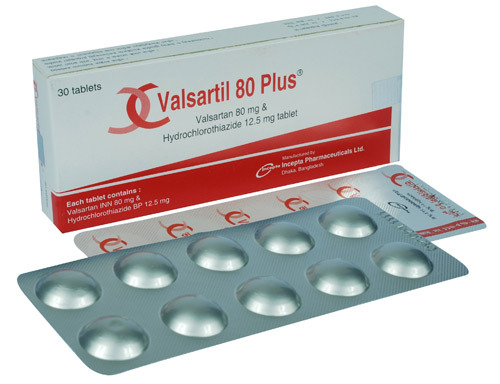 Valsartil Plus is indicated for the treatment of hypertension. A patient whose blood pressure is not controlled with Valsartan and Hydrochlorothiazide monotherapy, should switch to Valsartil Plus once daily. Highest allowed dose of Valsartan should not be greater than 320 mg in combination with hydrochlorothiazide 25 mg.
For Elderly: No initial dosage adjustment of Valsartil Plus is necessary for elderly patients. Use in Patients with Renal Impairment: The usual regimens of therapy with Valsartil Plus may be followed as long as the patient\\\'s creatinine clearance is >30 ml/min. In patients with more severe renal impairment, loop diuretics are preferred to thiazides. In that case, hydrochlorothiazide is not recommended. Use in patients with Hepatic Impairment: Care should be taken in patient with hepatic impairment. The combination of Valsartan and Hydrochlorothiazide is generally well tolerated and side effects are rare. The most common side effects include headache, dizziness, fatigue, abdominal pain, cough, diarrhea and nausea. Patient may also experience hyperkalemia, impotency, reduced renal function, allergic reactions, dyspnea, constipation, back pain, muscle cramps, rash, anxiety, insomnia and vertigo. Hypotension may also occur. Impaired Renal Function: Dosage reduction or discontinuation may be required with patients having pre-existing renal impairment because thiazides may precipitate azotemia. Heart Failure and Myocardial Infarction: Caution should be observed when initiating therapy in patients with heart failure and post-myocardial infarction patients. Nursing mothers: It is not known whether Valsartan is excreted in human milk. Hydrochlorothiazide is excreted in breast milk.